The UN secretary general, Ban Ki-moon, has said hundreds of millions of Earth hour participants around the world will demand a strong global climate agreement by switching off their lights for an hour on Saturday night. Many of the world’s brightest lights will go dark at 8:30pm (GMT) as Earth hour marks its ninth year. In a video address, Ban said the symbolic switching-off held more significance than ever, just nine months before a pivotal UN meeting on the climate crisis in Paris. “Climate change is a people problem. People cause climate change and people suffer from climate change. People can also solve climate change. This December in Paris, the United Nations is bringing nations together to agree a new, universal and meaningful climate agreement. It will be the culmination of a year of action on sustainable development,” said Ban. More than 7,000 cities in 172 countries are expected to take part in the world’s largest ever demonstration, which has grown from a single World Wildlife Fund (WWF) event in Sydney in 2007. “Earth Hour shows what is possible when we unite in support of a cause: no individual action is too small, no collective vision is too big. This is the time to use your power,” said Ban. Some the world’s most famous landmarks will turn their lights out. The UN building in New York will join London’s Houses of Parliament, Rio de Janeiro’s Cristo Redentor (Christ the Redeemer) and the Eiffel Tower in Paris. In Bulgaria a giant Danube sturgeon fish will be drawn in fire in the capital, Sofia. Millions of other, more humble, participants will take part by simply switching from electricity to candlelight for an hour. Colin Butfield, director of campaigns at WWF-UK said the mass participation was a demand for climate action and politicians should take heed. “The fact that such a huge number of people are taking part in Earth Hour across the world and are using it as a moment to inspire action on sustainability in their own communities sends a really clear message that the public is ready to tackle climate change – we now need politicians to show the same drive,” he said. Britain’s energy and climate change secretary, Ed Davey, who has been heavily involved in the climate negotiations at the UN, called for a response to climate change that was commensurate with its threat. “It’s time for everyone to recognise that climate change will touch just about everything we do and everything we care about. Earth Hour is an excellent opportunity for millions of people across the world to take one simple step to show they’re serious about backing action on climate change,” said Davey. 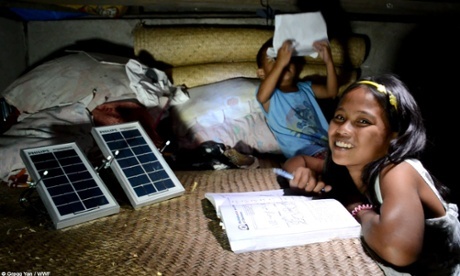 Joy Dominguez, 11, studies under a solar lamp. Ban said the focus on climate change should not distract from Earth Hour’s other key mission: introducing clean energy to the most remote and impoverished communities on Earth. “By turning out the lights we also highlight that more than a billion people lack access to electricity. Their future wellbeing requires access to clean, affordable energy,” he said. In 2014 Earth Hour used a crowdfunding platform to raise money and deliver thousands of fuel-efficient stoves to families in Madagascar and solar kits to remote villages in Uganda. The organisation also supplied islands in the Philippines with solar power for the first time and raised money for victims of Typhoon Haiyan.